Sunday was a memorable one thanks to the hunting club "Glenkar". Seamrog went on the first of his life hunting, he was quite taken aback! Our chic result - two partridges. Very tasty! Dear friends! I am very sorry that the site for so long no news. 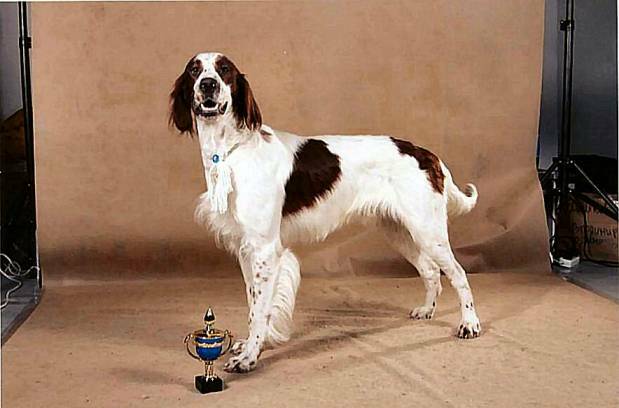 During that time, much has been - Seamrog got 5 BOB, 2 BIG-III, 4 CACIB, became the champion of Ukraine (+ Ch. UKU&BBB) and Belarus, 2xCh. of Eurasia, as well as participated in the hunting trials and got 61 points (double snipe)! Unfortunately, I have in front of a very difficult exam, and two months of travel :(, but I promise to tell everything in detail later!!! Feb. 18 Sham was two years old! Happy Birthday to his brother and eight sisters and wish them all the best!!! 18.02.2013 Шамошке стукнуло два года! Желаю ему отменного здоровья, верного чутья и хоть чуть-чуть побольше шерсти! Yesterday we have made great opening of our third show season! At the same time talk to many members of our hunting club "Glenkar", and I even tried to help someone (unfortunately, not always successfully) to show his dog. Our show's results - in section "Exhibitions"
Snow height more than half a meter, and I still do not have pictures with Seamrog in the snow? Yesterday we have corrected this! Unfortunately, last year's field is already not available - there are built high-rise buildings. But we had a walk on the waste ground a block away from home. 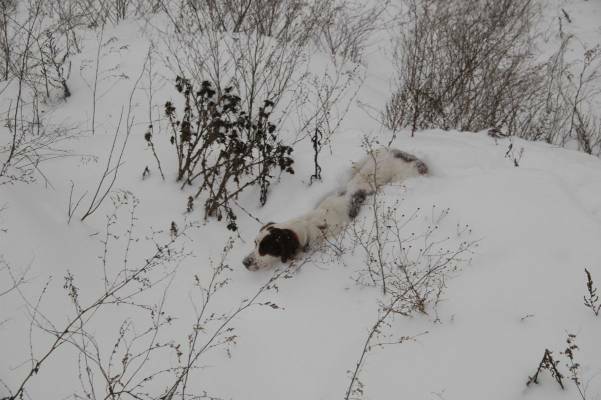 Even found partridges, where Seamrog worked as a real setter! I have just received e-mail from the AHT: Seamrog free of von Willebrand disease!!! Только что пришло письмо из британской лабаратории Animal Health Trust, которая занимается всякими генетическими пакостями редких пород, в том числе красно-белых. В нем написано, что Шамрог свободен от болезни фон Виллебранда (аномалия крови, вызываемая близкородственным скрещиванием)! Dear English-, French-, Deutsch-, Italian- and other-language-speaking friends! Do not be alarmed to see an abundance of Cyrillic on this site. All information is duplicated in English, you can just press the " Читать дальше..." (" Read more ") on the news page, or scroll a bit down on other pages.